By Jack Neff . Published on November 03, 2016. Amazon's private-label program has become a major threat to big brands in certain categories, particularly batteries, according to a new analysis from 1010data, the data management firm. Based on measurement of online spending from a panel of more than 10 million consumers between September 2015 and August 2016, 1010data found that Amazon and affiliates controlled a whopping 94% of the approximately $113 million in online battery sales. The AmazonBasics private label had a 31% share of online battery sales, according to 1010data, more than double the 13.1% share that private-label batteries had in offline stores for the 52 weeks ended Oct. 18, according to Nielsen data from Deutsche Bank. AmazonBasics, in fact, easily outsold every battery brand online, including offline leader Duracell, now owned by Berkshire Hathaway after Procter & Gamble Co. divested it in March. Duracell had a 21% online share. The titans of offline batteries can take solace in the fact that the online category remains small. It's only around 4% of the Nielsen-measured offline business, which doesn't even include big outlets like Costco, home improvement stores and some dollar stores. But the online battery category is growing fast, up 75% in the past year, according to 1010data. And AmazonBasics is growing even faster, with sales up 93%. 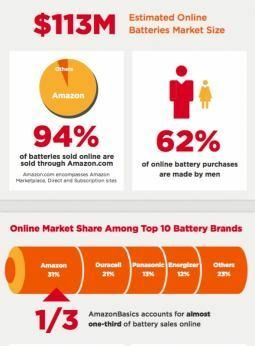 The conversion rate, or the percentage of people who buy batteries after viewing them online, is 17.7% for AmazonBasics, vs. 9.8% for the category as a whole. Amazon is also making less-dramatic headway in other categories such as baby wipes, where its Elements private label has 16% of the estimated $60 billion in online sales. Here Amazon and affiliates have a smaller but still commanding 80% share of online sales, according to 1010data. Kimberly-Clark Corp.'s Huggies and P&G's Pampers are the category leaders in wipes online, just like offline. And at this point, Amazon's private-label share is still behind the nearly 37% store-brand share in offline outlets measured by Nielsen. But at less than two years old, Amazon Elements is newer than AmazonBasics, which launched its batteries in 2009. Amazon also has a commanding presence in the bigger $1 billion market for online speakers behind its Echo brand, according to 1010 data, with a 45% market share among the top 10 brands sold. Echo sales are up 67% year over year, according to the firm. "No matter the market, the challenge for brands in an increasing number of categories is that Amazon is the top online channel," said Jed Alpert, senior VP-marketing at 1010data, in a statement. "The bottom line for brands is that they can no longer view Amazon as solely a channel and need to acknowledge Amazon as a competitor." 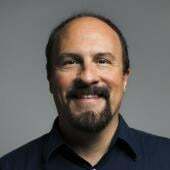 Reasons for Amazon's private-label success vary across markets, he said, with price the key driving factor in batteries, but a truly innovative product fueling the growth of Echo.